Are you curious how we are spending our time during our “Professional Day” today at OJCS? 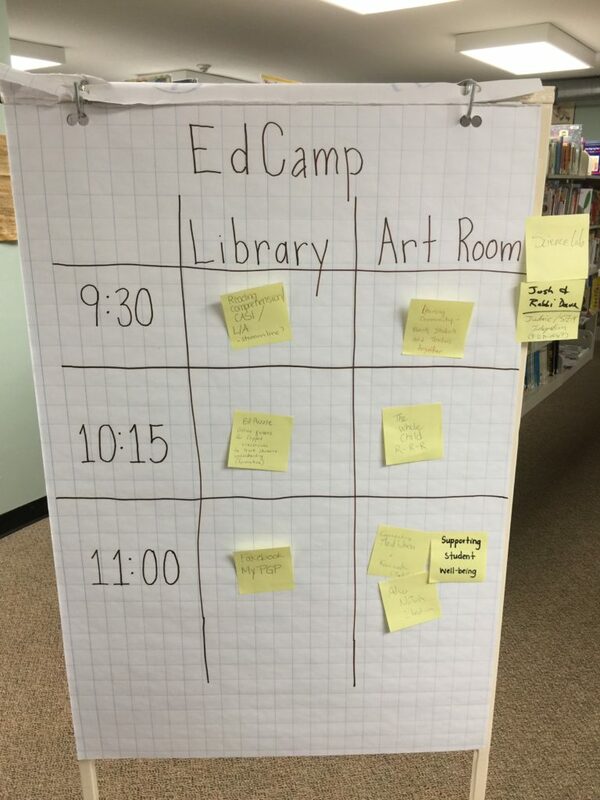 Well, the first part of the day will be an “EdCamp”! EdCamp is an “unconference” – an opportunity, without intense preparation or anxiety for teachers to “own” their professional learning. 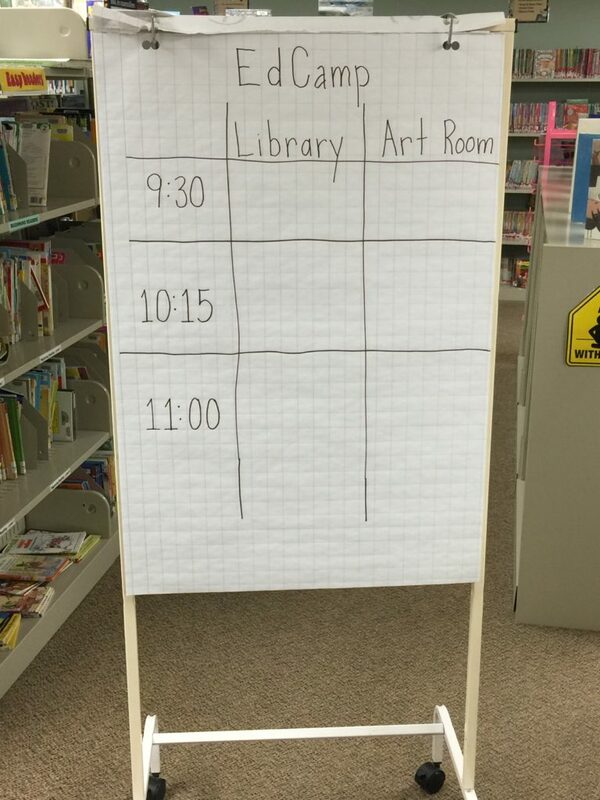 Teachers will show up at edcamp and find a blank schedule – only time slots and locations. They will then decide what topics they want to present on or which conversations they wish to facilitate and simply sign up until the schedule is complete. And then the learning begins! Sounds simple, which it is, but its power is in recognizing how much teachers already have to offer and how strong their desire is to learn from each other. It is also an important acknowledgment that they are already experts in important topics and, thus, there is no need for intense preparation – simply share the work. 9:30 AM OJCS EdCamp is Ready to Launch! OK…we are up and running! 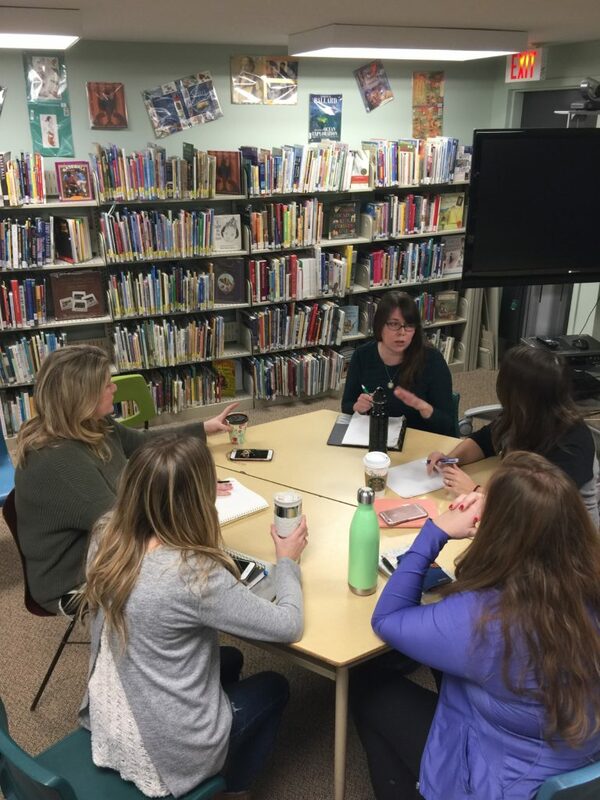 We have Language Arts teachers across the grades, along with the Librarian, are having a meaningful conversation about how we currently assess students in language arts – which assessments, which benchmarks, etc., – and how we have been and should use the data to help students. Teachers are engaged in conversation around the CASI Reading Assessment that we currently use in Grades 4 and higher. 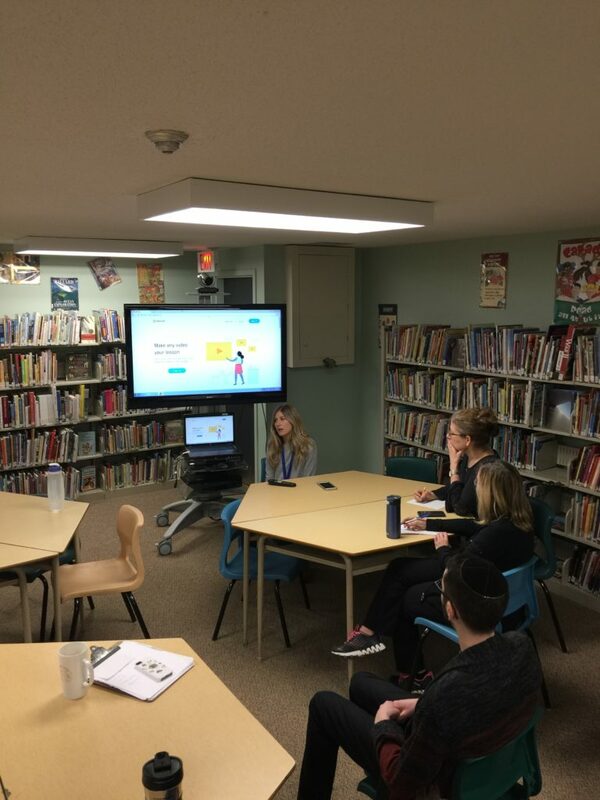 Teachers are sharing how they are currently using it. The Librarian is sharing a little about the other kinds of reading assessments she has been exploring. Our school also currently uses RAZ in Grades K -3. What is great about the conversation is the attempt to connect the dots between the grades, between the assessments and about being clear about who the audiences are for the data – is this for students, teachers, parents, all of them, etc.? I have to go peek in on the other sessions…but I look forward to seeing what emerges out of here and how it will enhance reading at OJCS! 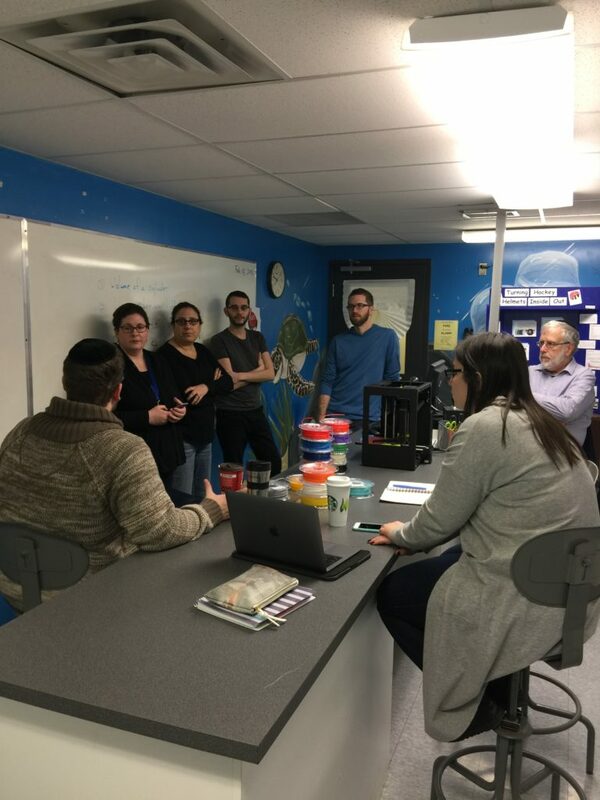 We have Science and Jewish Studies Teachers exploring how to integrate our new 3D printer with Jewish Studies content. This is what the magic of Jewish day schools is all about! They are getting a tour of how the new 3D printer works and exploring fascinating opportunities for integrating Jewish Studies content. What if we wanted to create a model of the Temple in Jerusalem? What if we wanted to make a dreidel? They are about to print a key just to see how it works, but the ideas that flow out of here are going to dramatically impact project-based learning at our school? How? Stay tuned! Session #3: How Can Teachers, Parents & Students Learn Together? 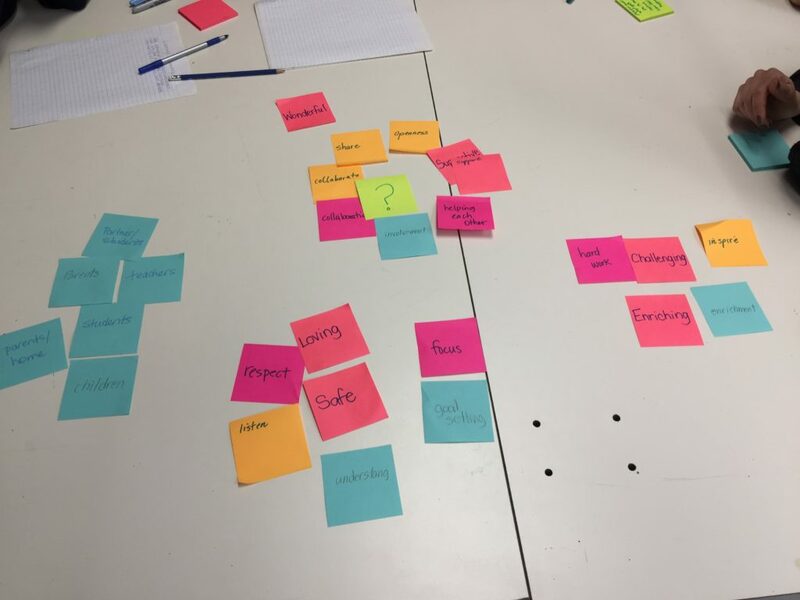 Jumping in to the end of a session is always hard, but I can tell just from the layout of the table that the impact of the Design Team is already beginning. 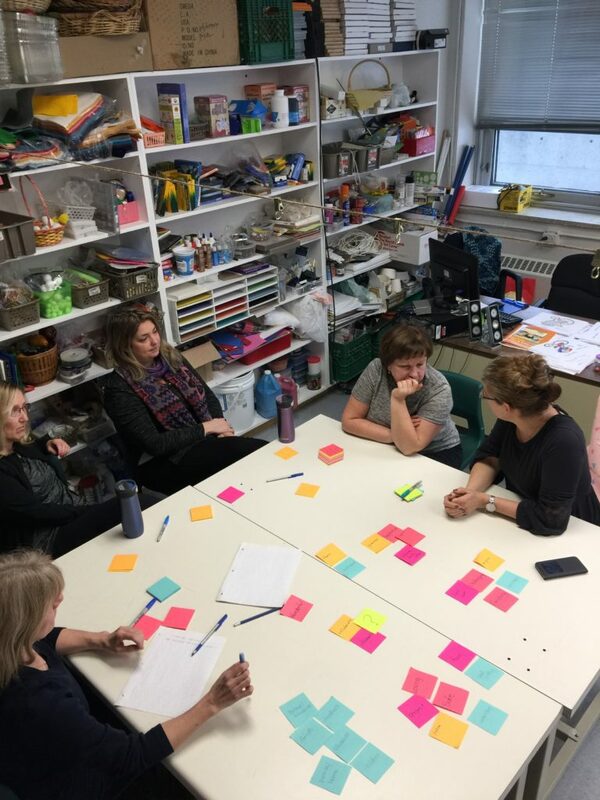 They are engaged in data immersion as all those post-it notes will be created, synthesized and lead to new ideas and prototypes. They have been engaged in design thinking around a prototype for Passover this year that leads to a family learning experience. Teachers are sharing examples from prior years and are practicing the art of asking deeper questions. For example, “What do parents really learn from some of our family experiences?” If you want parents to be meaningfully engaged in the learning, you will need to consider them as learners in the planning. 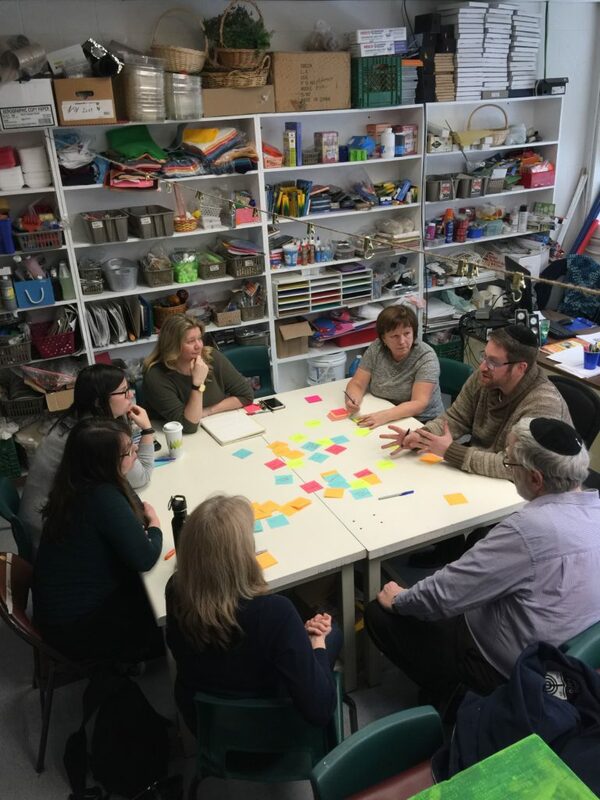 …all teachers and staff at a Jewish day school are Jewish educators. …that there is no reason for “OJCS” to exist, if not for the “J”. …parent engagement is a critical component for making it true. As the conversation moves towards the end, they are having a remarkable conversation about how religion and faith have changed in society at large and how it impacts parent engagement at OJCS. …did they watch the video? …how did they do on the quizzes? The big idea being that she is then able each day, based on the data, to tailor that day’s work according to which students grasped which concepts. She can group students together according to their exact needs, can assign more targeted schoolwork, decide who needs teacher attention, etc., and it can totally change day to day based on student needs. Teachers are now asking great questions about how to use this pedagogy with other topics and other grade levels. What does this look like in a Grade 3 Social Studies class? Grade 8 Jewish Studies? Teachers are now asking great questions about how to create the flipped videos (she uses the app “Explain Everything“). …is it about how much they know? …or is it about who they are? What kinds of memories are being created? As the conversation starts to shift towards sharing ideas, the sands are almost through the hourglass and we have to move on to the last round. 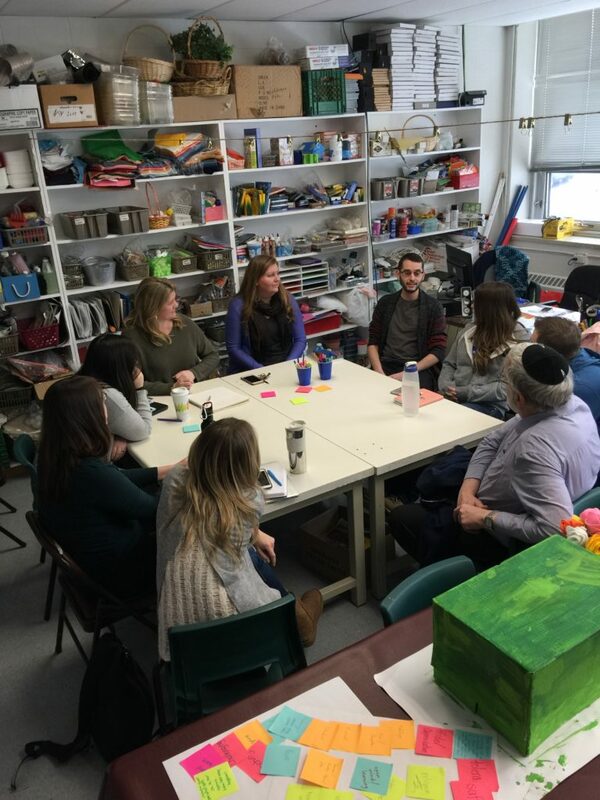 Emerging from the data immersion captured by the Design Team, two members of the team are leading a conversation on how to help students in our school (re)gain “Composure” (one of Ken Robinson‘s 8 “C’s”). A teacher shares how he marries meditation from Calm and tefillah to enhance kavanah (intentionality)…and how he is also experimenting with Headspace. That leads to a great conversation with one of our Rabbis about traditional modes of meditation, the impact of meditation on prayer, etc., etc. I can’t believe I am popping into our last session! 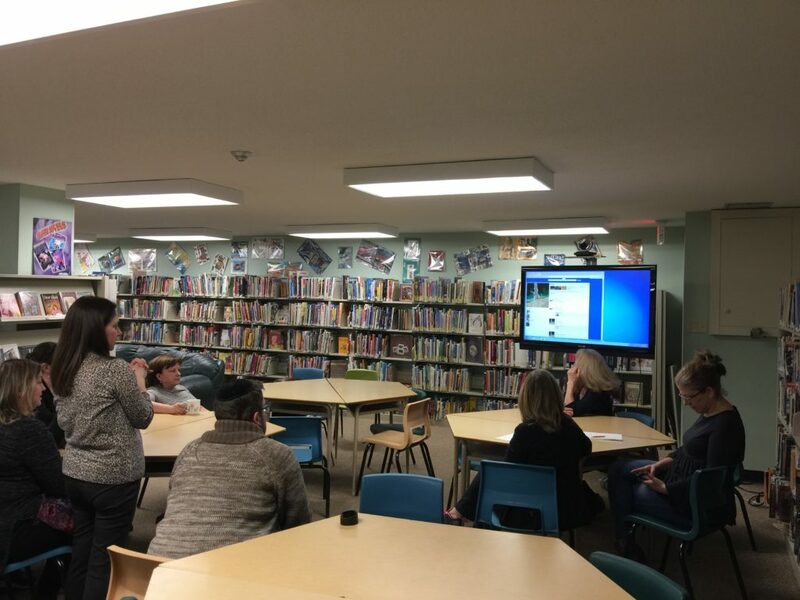 This is a conversation on how one teacher is incorporating Fakebook as a pedagogy in the teaching of Grade 3 Social Studies. She is explaining her own learning as well as how she is introducing it with her students. Teachers are now sharing ideas about how to enhance the unit and creative ways to play with the pedagogy. This is a lively conversation and it reinforces again (!) how much impact I can see from just one site visit on the Design Team…and the Design Team’s impact on the faculty. That’s it! Our first OJCS EdCamp has come to a close. I can’t wait to see how these conversations will impact teaching and learning at our school. I look forward to more creative opportunities to harvest the excellence that already is, while adding new ideas to create the future that will be.